The track irregularities and their interaction with wheel generate vibration of varying amplitude and frequency. These vibrations may cause damage to different parts of the vehicle if not contained and also return it back to the track. These vibrations are contained by suspension arrangement. Suspension usually consist of two stages primary and secondary suspension. The primary suspension consists of spring and damper components between the bogie and the wheel set, in order to secure a stable running behaviour, and also to ensure low track forces, low wear and good behaviour in curves. There are normally four axle-box dampers in each bogie. By including primary suspension the, lateral stability of the wagons and the ride quality can be significantly improved. This is due to the lower unsprung mass as the size of the unsprung mass directly relates the amount of force transferred into the car body and track from wheel or track irregularities. The secondary suspension interconnects the carbody and bogie, with the purpose of isolating the carbody from excitations transmitted from track irregularities via the wheelsets and bogie frames. The air spring is part of the secondary suspension of most modern passenger rail vehicles, placed between the carbody and bogie. Its main task is to reduce carbody accelerations in the lower frequency range, around 1 Hz. good sound and vibration isolation. Cost and complexity are two disadvantages mentioned together with air springs. 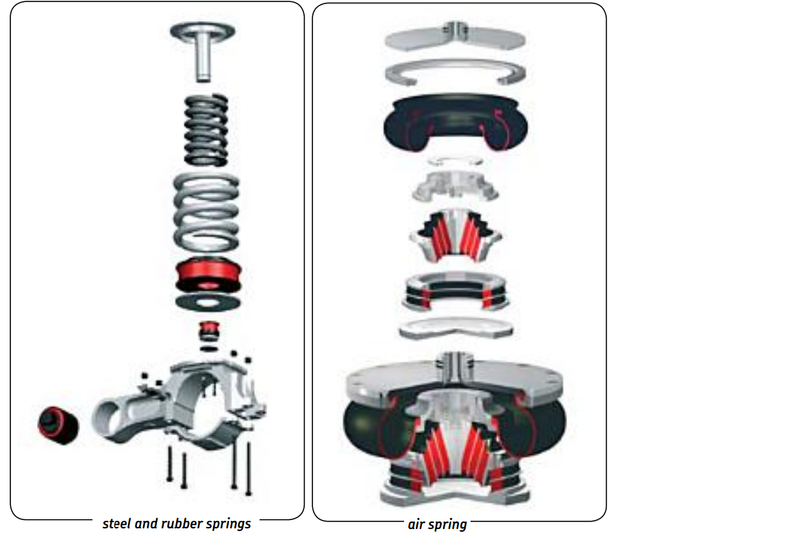 Figure: A typical air spring system in a rail vehicle.